Greeneville City Schools is proud to announce their 2019 District Teachers of the Year. 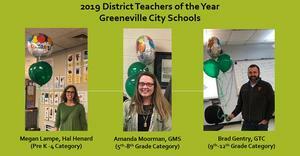 Each school selects a building level Teacher of the Year, and then a Teacher of the Year Committee selects district level winners. Those individuals will advance to the next level of competition and a chance to earn the Tennessee Teacher of the Year Award in their respective divisions. Megan Lampe has been selected as the system level representative for grades Pre K-4. Megan is currently teaching 1st Grade at Hal Henard Elementary School. She has been a member of the Hal Henard faculty for 5 years. Amanda Moorman has been selected as the system level representative for grades 5-8. Amanda is currently teaching 8th Grade curriculum enhanced courses in English/Language Arts and Science at Greeneville Middle School. She has been a member of the GMS faculty for 7 years. Brad Gentry has been selected as the system level representative for grades 9-12. Brad currently teaches 9th-12th Grade Pre-Engineering and Robotics at the Greene Technology Center. He has been a member of the GTC faculty for 7 years. Congratulations are expressed to the Greeneville City Schools district level winners! The school system is proud of their work and accomplishments, and sends its well wishes as they move forward at the next level of competition.